The KLEFR 692x is a compact single phase 100A direct connected meter designed for applications like photovoltaic systems (PV), electric vehicle chargers (EV) and building management systems (BMS). Due to its compact size (2 DIN Module) and easy installation, integration and configuration, the meter will fit in every PV, EV and BMS application that requires (MID) metering. All KLEFR meters comply with the Measuring Instruments Directive 2014/32/EU. The MID approval ensures the accuracy and quality of the meter and enables its use in billing purposes. The KLEFR 692x is measuring active energy with accuracy class B (=1). The certificates and other meter specifications can be found in the KLEFR 692x user manual. Data from the KLEFR meters can be collected and programmed via the M-bus, Modbus or Infrared interface. The KLEFR 6923 has a built in M-bus interface for communication. 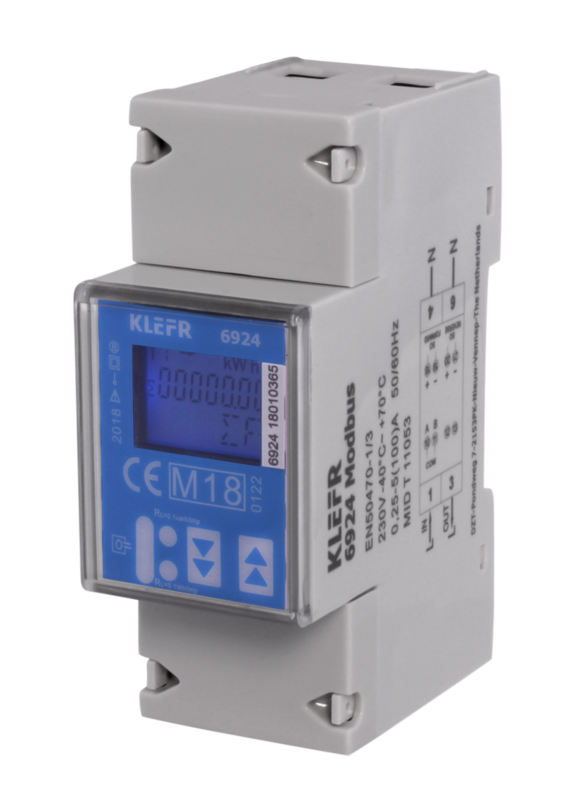 The KLEFR 6924 can communicate and be programmed via the Modbus RTU (RS-485) interface. All KLEFR meters are equipped with an Infrared interface (for reading and programming) and a selectable pulse output. More information like the Modbus register map, M-bus specifications and infrared user manual can be found in the KLEFR 692x user manual. The free PC software for infrared communication is available here. Settings can be done manually and with a Modbus, M-bus or Infrared command. The settings can be checked in program mode 1 and changed in program mode 2 or 3. The settings in program mode 3 are password protected. Modbus/M-bus ID can be set to a value from 1 to 247 (Modbus) and 1 to 250 (M-bus). xxxand 300, 600, 1200, 4800 or 9600 (M-bus). Modbus parity can be set to even, none or odd. Automatic scroll function can be customized by adding and deleting display pages. LCD cycle time can be set to a scroll time from 1 to 30 seconds. Backlight mode can be set to ON, OFF or Button mode. S0 output can be set to 10.000/2.000/1.000/100/10/1/0,1/0,01 imp/kWh. xxx05=forward+reverse, 06=reverse-forward, 09=forward-reverse and 10=forward-reverse. Power down counter can be reset to 0. OBIS codes can be turned ON and OFF. Password can be changed in program mode 3.